Maigret finds himself on a tour of the USA, a guest of honour mostly meeting with other police officials and observing the way Americans conduct their police and justice work. While he is in Tuscon, Arizona, he gets dumped off at a coroner’s inquest, and finds that the case captures his attention. Several men from the army base spend the night with one young woman, and in the morning she ends up being killed by a train, lying prone on the railroad tracks beside a highway. There’s a big focus in this novel on the way things in the US are different from France, specifically in the American South-West. Reading it more than fifty years after it was written, I found it more interesting not for what it says about that part of the US, but for how much I know it’s changed since then, even as an outside observer. For example, it’s stated that in the US almost everyone is a member of a social club; obviously not true anymore. And the ubiquitous presence of Bromo Seltzer is odd, since that was apparently taken off the market sometime after this novel was written. The Asian and black characters are also treated by the narrative in an odd way, sort of like exotic birds. Unfortunately, the novel itself isn’t that strong. I found its main weakness to be that Maigret walks into the case partway through, and the book is half over before we find out if there is a body, and what might have happened to it. There are also about five characters who are among the suspects who are all introduced together, and as they are all in the military and have similar generic names and few defining characteristics, they all blended together for me. Information revealed in the last chapter didn’t have much impact, since I found the suspects were pretty much interchangeable. One of the weaker Simenon novels I’ve read. Maigret investigates the case of a homeless man who is brutally beaten and nearly killed in Paris. The question that keeps troubling him is why a person would want to hurt one of the down-and-out, who have nothing and are generally powerless. The story takes a few twists and turns, and the conclusion is both a bit of a surprise and totally appropriate to the story. 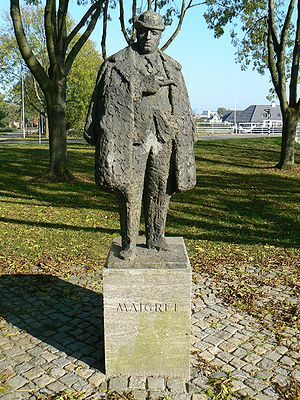 Maigret Statue, in Delfzijl, the Netherlands, where the first Maigret novel was written. One of the themes that Simenon touches on repeatedly is the way that Maigret identifies with the world of the homeless people who have either been rejected by society or, like the victim in this case, have rejected society themselves. 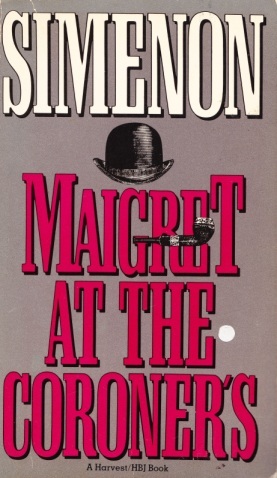 Though Maigret cannot speak it aloud to the others he works with in the police department, he has enough insight to see that the government justice system is not true justice, and that there are people in this world who don’t care a whit for the legal system society has put in place, no matter what it prohibits or what rewards it might offer. A smooth and quick read, excellent for a time when I was feeling a bit bogged down by much larger books.